CNG: eAuction 438. BRUTTIUM, The Brettii. Circa 208-203 BC. 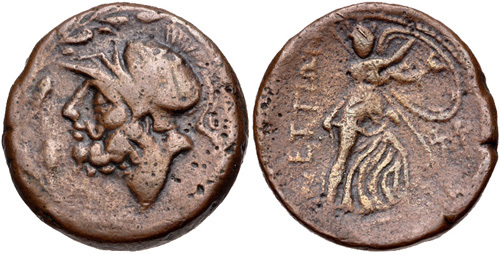 Æ Double – Didrachm (24mm, 11.54 g, 12h). 438, Lot: 19. Estimate $100. BRUTTIUM, The Brettii. Circa 208-203 BC. Æ Double – Didrachm (24mm, 11.54 g, 12h). Helmeted head of Ares left within wreath / Athena advancing right, head facing, holding shield, spear leans against her; lyre to right. Scheu, Bronze 59; HN Italy 2000. Near VF, brown surfaces, some pitting.